Could Android Take Over the Tablet Market? 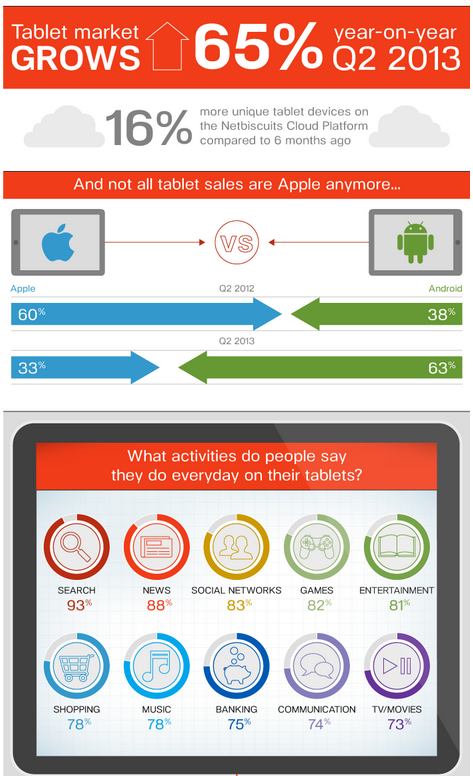 Android’s tablet sales nearly doubled in Q2 2013 compared to the same time last year, according to a new Netbiscuits infographic. The infographic reveals that the tablet market has grown 65 percent year-over year, and that there are now 16 percent more unique tablet devices on the Netbiscuits Cloud Platform compared to six months ago. In addition, in Q2 2013, 63 percent of tablet sales were Android devices, while just 33 percent of tablet sales were Apple devices. The infographic also sheds light on the top daily activities for tablet users, with the top activity being search, followed by news, social networks, games and entertainment. Notably, shopping tied with music as the sixth most popular activity, with 78 percent of consumers claiming to use their devices for online shopping. When broken down by country, however, online shopping ranks as the fourth most popular tablet activity in the U.S. It is also important to note that the infographic touched on how a bad experience on a tablet can impact business, with 46 percent of tablet users claiming to visit a competitor’s website upon a bad site experience on their tablet device. View the entire Netbiscuit's infographic here.